From an early age Morihei Ueshiba studied different traditional Martial Arts, known as bu-jutsu. He became a master of several styles of ju-jutsu, sword arts (kenjutsu), and spear combat (sojutsu). The most significant influence on his technique was his meeting with Takeda Sokaku, grandmaster of Daito-ryu Aiki-jutsu. Despite his achievements in these arts he felt that something essential was lacking. Morihei’s quest was always primarily spiritual rather than martial, and although he gained much from Sokaku, he was still searching for something deeper than expert technique and devastating power. It was evident to O-Sensei that today’s victory woluld be defeated tomorrow, that the strong man will ultimately meet someone stronger and that pursuit of brute force must end in frustration. O-Sensei understood that the most formidable opponent was himself and the real battle of life is to overcome the qualities of pettiness, ambition, and selfishness. Morihei Ueshiba discovered that the spiritual potential of the martial arts, the real purpose of the Budo – Martial Way, is to purge one’s character of these undesirable traits and obtain control of one’s body and mind. O-Sensei combined all that he had learned from others martial arts with his vision of the inner meaning and purpose of Budo. 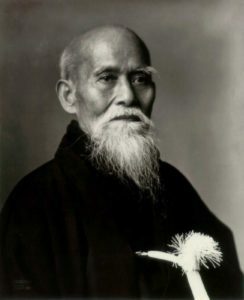 Over the years, Morihei Ueshiba gradually modified the originals mortal techniques and added others. The result of these concepts is Aikido – martial art without martial techniques.